Read More One thing that can be said about Sara Groves is that she loves to pen a song. 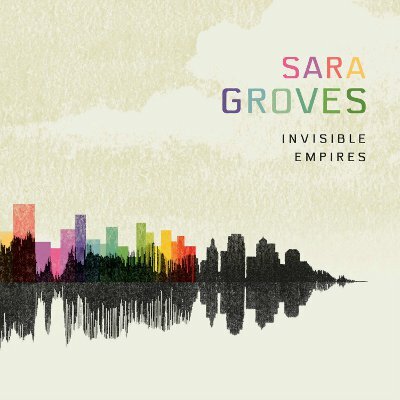 Invisible Empires is her tenth album and is the follow up to 2009's Fireflies and Songs which had some great reviews from around the world. But Sara didn't just want to produce another album that was similar to that release, she says in the build up to this album "Fireflies is very much like a girl and her piano, and I knew this record was going to be a little bit bigger than a girl and her piano. I like to write pop songs, I like to write bigger songs. I like strings and guitars, so I guess when I went to go write this record I didn't feel like this was going to be Fireflies Part II.". These songs are not necessarily different in style, there is still an element of the piano led acoustic rock, slow tempo, melodic songs that Sara is very good at writing. But when she says the songs are bigger, what I think she means is that the songs have more layers to them, be that a few extra instruments or even a little bit of atmospheric piano to pad out the sound, the songs just seem fuller than maybe some of her previous songs. For me there are two standout parts to this album. The first part is the voice of Sara Groves. She has a kind of warm yet whispery soft vocal that draws the listener in and fits with the songs that if you heard some other vocalist singing then it wouldn't work. The second part of the album that really lured me to enjoying the album as a whole was lyrically Sara likes to have a conversation in her songs, these aren't songs that have generic lyrics, this is a woman showing and telling us all how she feels about her life. So what songs stood out for me, well Eyes On The Prize with its Gospel start is an amazing radio friendly single that has already been making waves, an all round melodic number that is sure to be a fan's favorite very soon. I'll Wait is a great story about waiting on God, with lyrics of "I can't run with the horses, If I can't keep up with Men... I can work like the devil, Build a tower to the sky, I can work for my possessions till they empty my life". In the verses the chorus simple says "I'll wait for you, Now more than ever, I see it's true, now more than ever, I'll wait for You now". I could give more examples of great moments on the album, from the clever Obsolete to the soft piano led Miracle - the album is jammed with expressive strong though provoking songs. You may thinking after reading this review, this has to be 5 stars out of 5, but looking down you will see I haven't given it full marks. Why, I hear you cry. As much as I genuinely love this album and the voice that is Sara Grooves, at times if you're not in the mood for this kind of soft melodic music you can see that the album songs can easily flow too easily into one another. A fault of my own you might add, and you are correct. Yet the emotional track Obsolete gets me every time, a sure fire hit that needs to be released as a single. It will make you smile, cry, and think, well basically the whole album makes you do that. Taken from her brilliant new album 'Invisible Empires', this is the gifted songstress Sara Groves with her song 'Eyes On The Prize'.